The much restored nave and chancel are mostly late C13 but possibly have a C12 origin. The unattractive tower and vestry are C19, as is the remarkable pulpit. The church was largely burnt out in 2010, but reconstruction was completed formally in 2014. 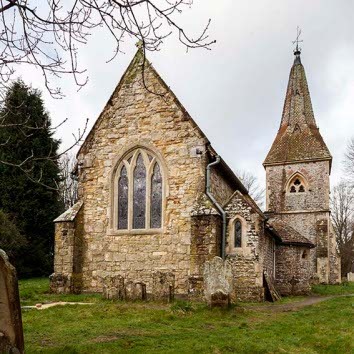 Whatlington church is some way from the village in the wooded country north east of Battle. Before the restoration of 1862, Hussey (p302) saw round-headed windows in nave and chancel, which would suggest that the church was C12 or earlier in origin, though nothing visibly earlier than the C13 can be seen either today or on any known drawing. On the assumption that Hussey was correct, the relative length of the chancel alone suggests it was extended in the C13. Its roofline continues that of the aisleless nave and there is no chancel arch. Though the walls have lost the render that they once had, the sequence of building remains uncertain, but the clasping buttresses at both ends are typically C13 and the east ones are unusually low. The pointed east window has three trefoiled lights with pierced spandrels and a string-course inside as a sill. Only partly renewed, it is as shown on the Burrell Collection drawing of 1779 and thus later C13, like the trefoiled lancet in the north wall of the nave and the west doorway, with a hollow-chamfered outer order. Sir Stephen Glynne, probably in 1826, saw two trefoiled west lancets (SNQ 17 (Nov 1968) p41), which have gone. They were of equal size and appear large for pre-Reformation work. The plain lancets in the nave and the sides of the chancel (partly hidden to the north) and the chamfered north doorway (only the lower parts are original) might be thought earlier C13, like the blocked south doorway of the nave and a small lowside in the chancel. Despite the differences, however, all are probably late C13. Glynne saw a wooden north porch with ‘feathering’ (i e cusped bargeboards), which sounds C14 (B 21 p31), though Saunders in 1860 shows a plain one. 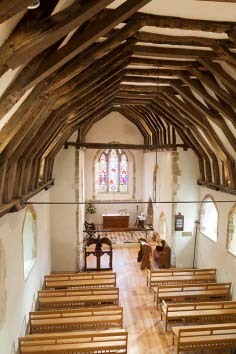 The nave roof was boarded in the C19, but its wall-plates with carved foliage remain from the late C15 or C16 and are probably contemporary with the uncusped square-headed south nave windows. The Burrell drawing shows a big, boarded wooden west bell-turret with a pyramid cap, probably of one build with the roof. 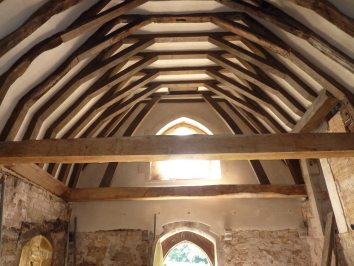 The present cusped beam between nave and chancel may not be old, but marks the position of the rood-beam. The church was drastically restored in 1862 by S W Tracy (ibid as ‘Tracey’). 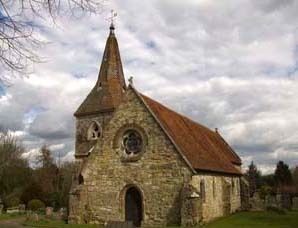 Apart from repairing the external stonework, he designed a chancel roof of cedar wood. Most conspicuously, he replaced the bell-turret by a coarse north west tower with a substantial tiled broach spire. East of it an apsidal vestry hides most of the north wall of the nave and the west gable was rebuilt with a large cusped circular opening. The new work is in unattractive brown stone, with blue and red brick dressings on the tower. The north side, the principal one, now recalls more than anything a mission church in a city and seems oddly out of place in such a rural setting. The west gallery, which may be based on an earlier one, was probably determined by the need to provide enough seating as cheaply as possible. In 1908 the lowside in the chancel was opened up (Langdon p25) and in 1955-56 repairs by H H C Sweatman were carried out (ICBS). There was extensive fire damage to the church in July 2010. 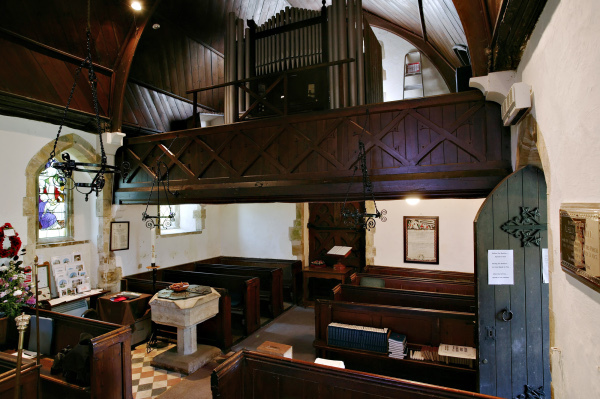 According to a report in The Bexhill Observer of 30 July 2010 the fire started in the organ-loft in the west gallery and thus the worst damage was to the nave. 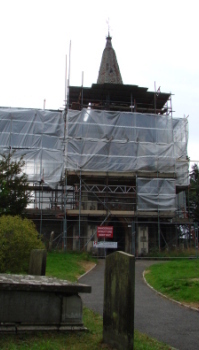 After some delay, consolidation of the structure was started by covering the whole church with plastic sheeting on scaffolding, whilst planning for rebuilding took place. A new architect was chosen, R Andrews of Carden and Godfrey (see under W E Godfrey). It was established that the mediaeval roof- timbers (dated to c1275 by dendrochronological testing, a result compatible with the architectural evidence) had escaped the worst of the flames, protected by Tracy’s oppressive boarding, and after restoration they have been put back with the timbers exposed and made good where necessary; this was chiefly necessary at the west end where the fire was worst. There were further delays when Tracy’s tower was found to be poorly built and leaning, whilst the roof of his vestry also required attention. By early 2012 the main roof was reinstated and re-tiled, though the original date for re-opening could not be attained. Following completion of the roof, a west gallery with a kitchen and WC beneath was added. The floor of the whole church is now level and the chancel redesigned. Seating in the nave consists of benches. The church was finally rededicated in February 2014. Chandelier: (At entrance to chancel) C18 brass. Font: C13 plain square bowl with the corners cut away, with an unusually slender octagonal stem. This was probably originally like other late C12 and C13 fonts in the area, notably that at Battle, with a bowl on a central stem and four corner shafts. The corner shafts have disappeared (as happened at Battle where they were replaced in the C19) and it is likely at Whatlington that one corner was damaged, either by accident or during the upheavals of the mid-C17, and that the three others were then cut back similarly in the interests of symmetry. 1. (South nave, third window) A L and C E Moore, 1904 (BE(E) p663). 2. (North and south chancel windows) Cox and Sons 1863 (www,stainedglassrecords.org, retrieved 16/2/2015). 3. (Nave south first window) Engraved Royal Arms of Elizabeth II, 1977, altered with wheatsheaves in 2013 by M Howse (signed). 4. (West window) M Howse. 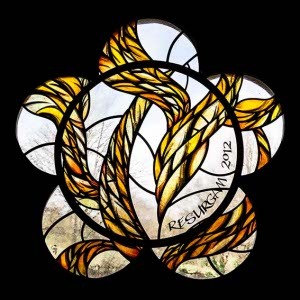 This depicts flames and is inscribed ‘Resurgam’ with the date 2012 in anticipation of the original date for re-opening before various delays ensued. Lectern: Large with an eagle. Designed by the Rev J A Hatchard (B 21 ibid) and said to have been exhibited at the Great Exhibition of 1851 by Pevsner (BE p629), a statement repeated with less certainty in BE(E) (p663). 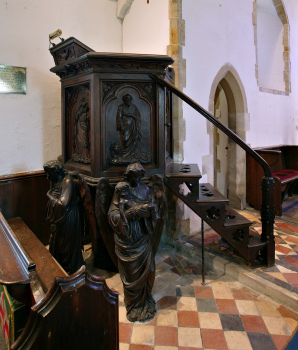 If correct, it implies that neither this nor the pulpit (see below) was designed with this church in mind. However, nothing that is likely to correspond to either lectern or pulpit is to be found in the Catalogue of the Exhibition. In the light of this and since Pevsner as was his custom cites no source for his statement, a date of 1862-63 would match the restoration and would also accord better with the known facts of Hatchard’s life. Finally, January 1863 is the date of the reference in The Builder that establishes Hatchard’s authorship. 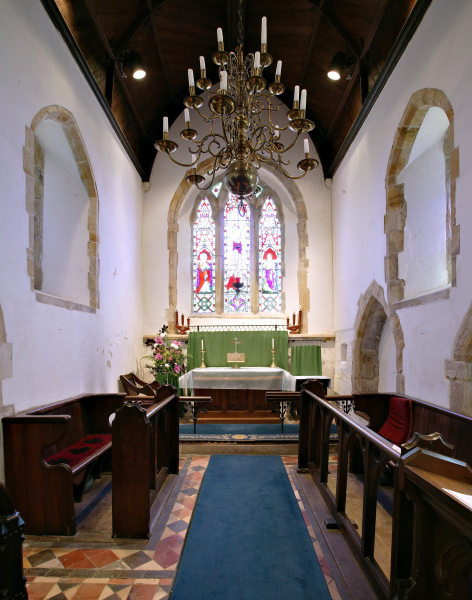 Piscina: (South chancel) Plain and square-headed. Probably C13. Pulpit: Made in Paris to Hatchard’s design and also said to have been shown at the Great Exhibition (BE ibid), though as noted above, the same questions apply. It is indeed a remarkable piece, standing on three angels representing Faith, Hope and Charity. There are saints in lower relief on the sides. It has not been fully reinstated since the re-opening, though figures from it are on display. Sedile: (South chancel) C13. Large and contained in a single plain and pointed arch. 1. My thanks to Nick Wiseman for all but the first four colour photographs. 2. My particular thanks to Jeffrey Bridges for providing me with most of the above information about the fire and its aftermath, including the photo of the interior during rebuilding in 2012. 3. 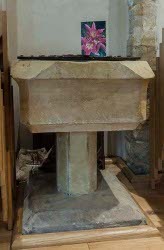 I had not had the opportunity to take good, modern and usable photographs of the interior of the church before the fire, including the pulpit in its glory. C B Newham has most kindly offered three, the first three of those attached, as a record of Whatlington church as it was. That of the west gallery and organ is especially poignant in view of the destruction there and so is that of the undismembered pulpit. Many photos of this and other churches of comparable quality can be seen and acquired from his website http://www.daephotolibrary.com.